I really like fried crispy foods. A flavorful crust of breadcumbs is ethereal, especially when encased in it is juicy, succulent pork loin. Whenever I have absolutely no idea what I want to make, this is an amazing recipe to go to. It can be done with chicken, beef, veal, duck, lamb, fish and even vegetables – but it is superlative with pork (obviously). We had just moved into the new house when I made this dish, because I knew it would be extremely easy to put together. I had a 2 lb piece of pork loin from my friends Weldon and Ariana of Emerald Glen Farms, which i started slicing up into cutlets. I created my dredging station – some seasoned flour, egg wash, and breadcrumbs. But, I couldn’t find the breadcrumbs. Somewhere in the craziness of moving, I honestly, couldn’t find them ANYWHERE. It was bizarre. And now, I was so deep in the milanese experience, I couldn’t imagine eating anything else. Crispy, crunchy, juicy deliciousness was the goal – and we were gonna get there, no matter what. This is where sometimes, you just gotta get creative. We had some bread in the fridge. I got the end pieces off the loaf and started pulling them apart to make fresh bread crumbs. I had some corn flakes, which I crushed with my hands. I seasoned this impromptu mixture up and went about on my merry way. It came out great, just as it always does. And as much as I love eating fried meat cutlets, it’s great to have a side that is really bright, acidic, and fresh to cut through the richness of the breading. The beautiful sun gold tomatoes we got from our CSA don’t need much. A little bit of sliced garlic, some fresh herbs, a little bit of hot chile, and a general dose of olive oil and basil. It’s always a perfect side dish – especially when the tomatoes are that good and fresh. It’s also really good with mashed potatoes, or sauteed mushrooms, or a kale salad, or gravy. A very versatile dish that should definitely be part of your repertoire. Set up your breading station. On one plate, spread the flour out and season lightly with salt and pepper. Mix everything to combine. In another plate/bowl, add the eggs and milk. Whisk until they are combined and season lightly with salt and pepper. In a third plate, add the breadcrumbs and season with salt, pepper, garlic powder, rosemary, and paprika. That is standard breading procedure. Next, start on the pork loin. Lay a large piece of plastic wrap on your cutting board, and put one slice of pork loin on it. Cover that piece with the remaining plastic wrap (or get a new piece if you didn’t have enough). Then, use a meat mallet or a really heavy cast iron pan, to pound it out until it is about 1/2 inch thick. Repeat with the remaining pork slices. Dredge the pork loin in the flour until completely coated, and pat off the excess. Then dip in the egg wash, and let the excess drip off. Lastly, put in the breadcrumbs and make sure every little bit of the pork is completely coated in it. Then put on a plate, while you finish breading the rest of the pork. 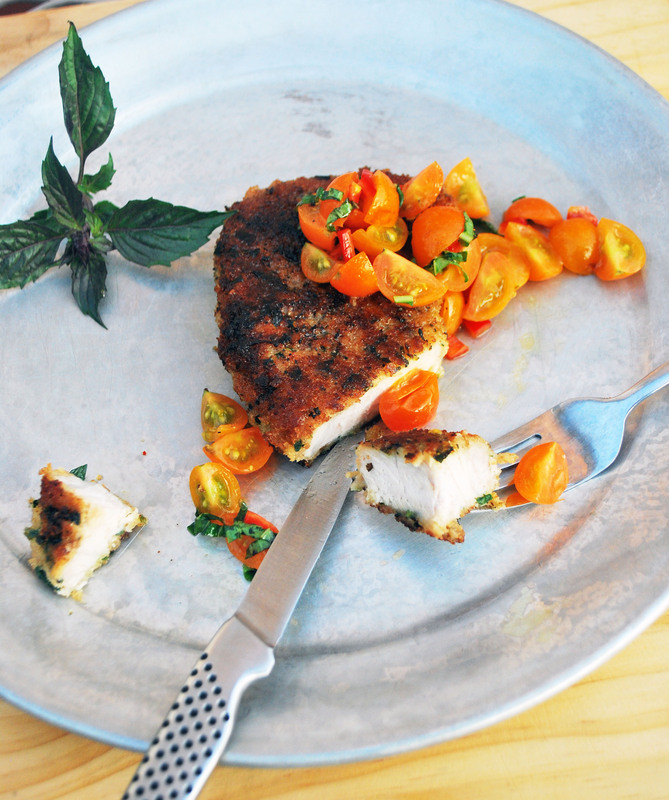 Once all the pork is breaded, stick it in the fridge for about 20 minutes, while you make the tomato salad. This will help the crust adhere to the pork, so it won’t slide off when you’re eating. To make the tomato salad: Combine 2 cups of sliced sun gold tomatoes, 1 cloves of minced garlic, 1 red jalapeno chile minced, 3 tablespoons chopped fresh basil, and a few tablespoons of extra virgin olive oil and red wine vinegar. Season to taste with salt and pepper. Let this sit for about 10 minutes to let the flavors come together. Now, time to make the pork. Get a pan over high heat and add two tablespoons of canola oil. Remove the pork from the fridge. Once the oil is almost smoking, add the pork loin and sear on each side, about 3 minutes per side, until the breadcrumbs are crunchy, and the pork is cooked through (about 140 degrees internal temperature). Remove from the pan and put on a plate lined with paper towels, or a cooling rack. Cook all the pork in the same way. 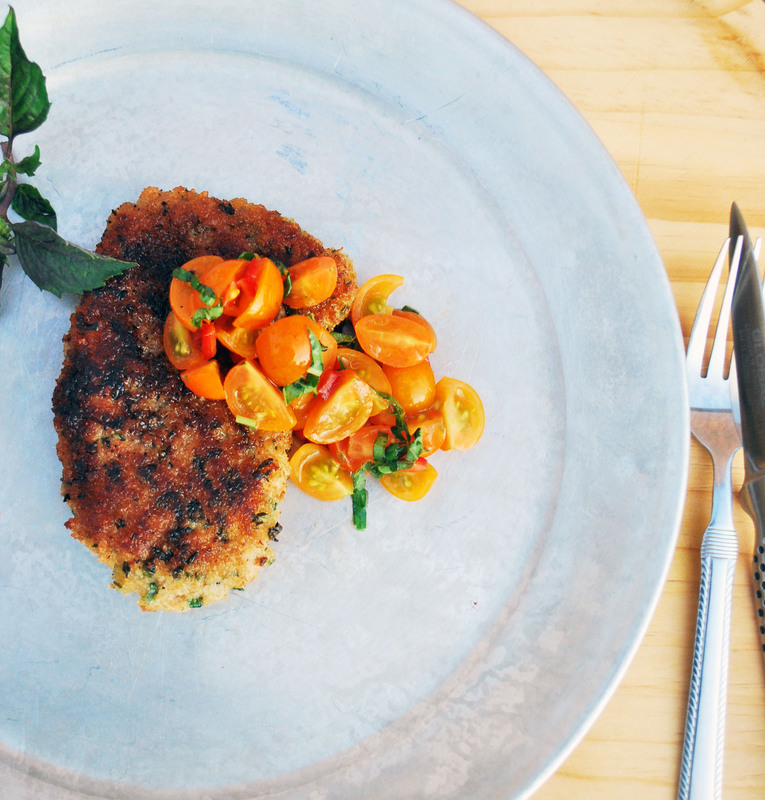 Serve the pork milanese with the tomato salad and you got a great meal, folks. Enjoy!